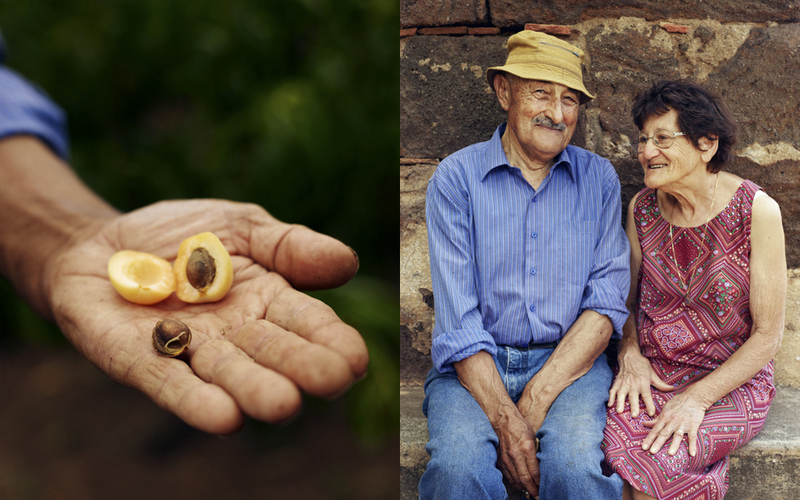 This week I went to see Centesimo and Anita, a couple that are devoting their life to farming in Scauri. 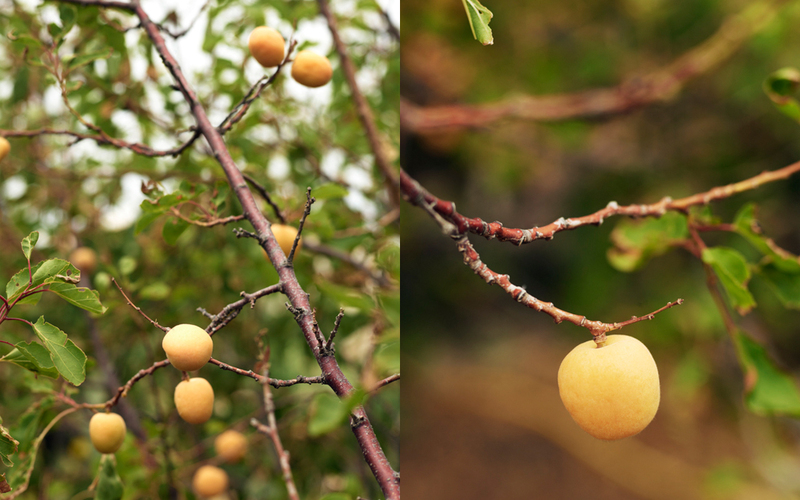 Their land is full of fruit trees, the gave me and my friend Ines a full basket of peaches, prunes and this lovely apricots. 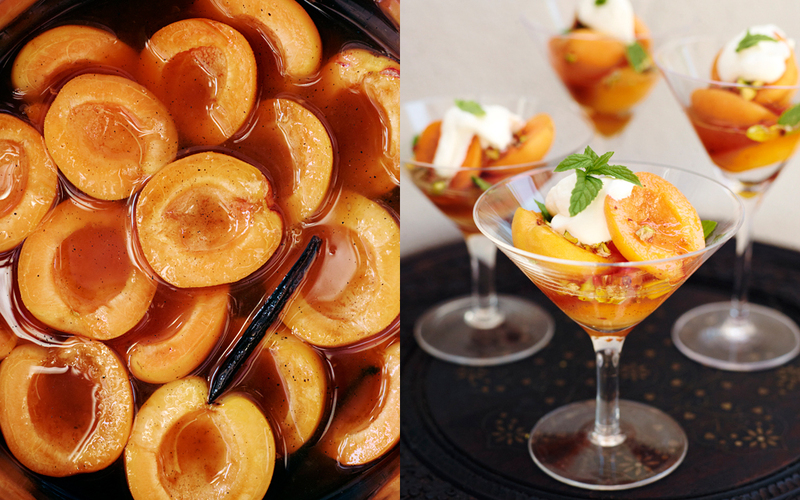 For dessert that evening I made apricots in Rum, it was easy to make and the flavors really blended well together. Wash and cut the apricots in halves and peel the stone. In a saucepan melt together rum, honey, sugar and vanilla and let it reduce by half, to become a syrup. Lower the heat and add the apricots few at a time to slightly simmer and to be coated by the liquid for about 3-5 minutes. Do not over fill the pan add just enough apricots into the pan using a slotted spoon to turn and coat them in the syrup remove into a bowl, then place into the pan the next round of apricots. When complete allow the apricots to cool down in the bowl pour remaining syrup over them. Once cooled separate the syrup and apricots, strain the syrup through a sieve and cover the apricots. Serve the apricots in a cocktail glass or similar glass bowl, 4 apricot halves for each portion, with a couple of tablespoons of the syrup, sprinkle some mint and pistachio nuts, if you desire as a garnish and top off with some whipped cream. This entry was posted in Dessert Recipes and tagged albicocca, albicocce, Anna Huerta, apricots, apricots in rum and honey syrup, Centesimo, dessert, dolce, fruits, http://www.annahuerta.com/, Pantelleria, Scauri, Sicily, stonefruits, summer, summer fruits, Under the Almond Tree on July 16, 2013 by Anna Huerta. Tusen tack för alla vackra bilder och recept. Imorgon åker jag till Oxford – men när jag kommer hem till San Pantaleo (på Sardinien) igen nästa torsdag skall jag genast pröva Ditt recept på ‘Apricots in rum and honey syrup’. Hej Margareta, tack för hälsningen, hoppas att aprikoserna blev bra. Önskar dej en härlig och fortsatt god sommar på Sardinien.